Games Industry Tops $100 Billion in Global Revenues - Plunkett Research, Ltd.
Never doubt the power of electronics and mobile devices to disrupt the traditional world. Most analysts believe that the electronic games industry, including game players, software, subscriptions and mobile gaming, has burst through the $100 billion in global revenues per year level. This means that games generate more money than movie theaters, book stores, recorded music downloads or magazine sales—all of which compete heavily for our entertainment time, attention and payments. Three extremely vital, interconnected components of the evolving personal entertainment, communications and media world include electronic games, apps and social media (GASM), and the lines between these three sectors frequently blur. For example, multiplayer online games encourage communication between communities of players, while social media like Facebook are often the platforms that support the most popular games. Meanwhile, apps are rapidly becoming the tool of choice for launching a wide variety of communications tools, entertainment and internet sites, including games. Users seamlessly let their online access flow from one segment of GASM to the other, and often use all three at once. 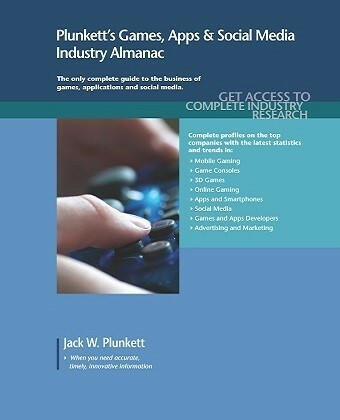 Plunkett Research recently published the 2019 edition of its Plunkett’s Games, Apps & Social Media Industry Almanac. This vital reference tool includes industry trends analysis, global car industry statistics and profiles of hundreds of leading automotive firms. It is available online to subscribers to Plunkett Research Online, as well as in printed almanac and ebook editions. Plunkett’s Games, Apps & Social Media Industry Almanac, 2019 edition. This entry was posted in News on October 29, 2018 by NOTadmin.